You can probably pile up the cliches. If it's not broke, then don't fix it. The more things change, the more they stay the same. 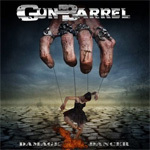 Germany's Gun Barrel strays little from the path with their sixth album, Damage Dancer. Gun Barrel: live and kickin'. With Damage Dancer like previous albums, one spin tells the tale. But, basically, with Gun Barrel you know what you're getting before you even push play.